This book was a purchase from a quaint little second-hand bookshop in Yungaburra, whilst on holiday in North Queensland. I thought this novel would be similar to ‘War of the Worlds‘ which I read earlier this year, but surprisingly it had few similarities to H. G. Well’s famous alien invasion novel. Oddly enough ‘The Day of the Triffids‘ had some interesting parallels to ‘Windup Girl‘, in that it deals with the fears of the time. 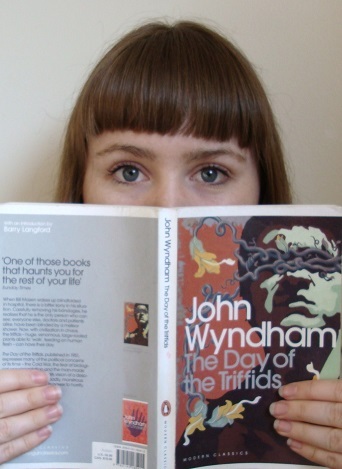 Wyndham writes to the biggest fears of the 50s, the threats of satellite weaponry and the Soviet Union, while ‘Windup Girl’ dealt with peak oil, genetic modification and threat of global corporations. Perhaps this explains why I found Windup Girl so frightening, and Day of the Triffids so ‘quaint’, as by tapping into the fears of the times dystopian novels may lose the menace as they age. I’m not certain of this, but I am certain that dystopias are written with the fears and issues of the time in mind, whether consciously or unconsciously. The plot of this novel is really a ‘love despite all odds’ taking place in England after a ‘meteor shower’ blinds most people, except those who were accidently unable to look outside at that time. The protagonist was in hospital with bandages across his eyes and awakes to a silent world. In addition to the chaos one can expect in a world where most people are suddenly blinded, the strange, aggressive, plants called ‘Triffids’ which had been appearing over the last few years begin to take advantage of the population’s blindness. ‘The Day of the Triffids’ is not a book with an overly happy ending, but I really enjoyed reading it. It was a great tale, with all the markers of a solid novel. I don’t often read books more than once, but I think I may read about the Triffids again in the future.